I’ve put this quilt onto my design wall and taken a full view photo. You can click on it to get a larger view and see it better. How do the colors look now? Are they too much? And a closer view of one section. My thought is that I will do faux trapunto of the embroidery flowers so it relates to the wool applique which is already padded and embelished. I can’t quilt onto the existing applique because the hopping foot won’t go over it. Too thick. The very center of the large flower stands about 1 1/2 inch above the flower. I don’t want to break a needle either if it should hit a bead. The center flower will need at least some quilting to hold the large area together. I’m not sure how it will be done just yet. 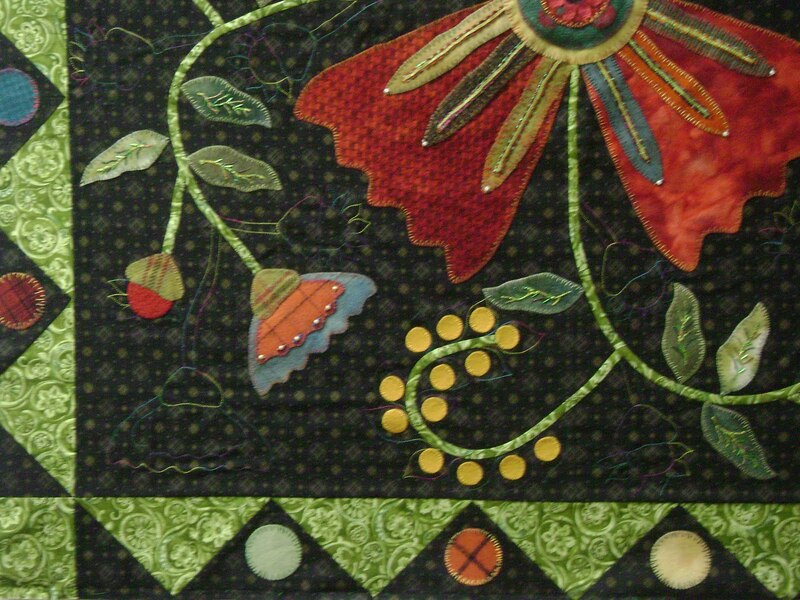 The applique is very colorful which is why I thought a colorful thread would work. 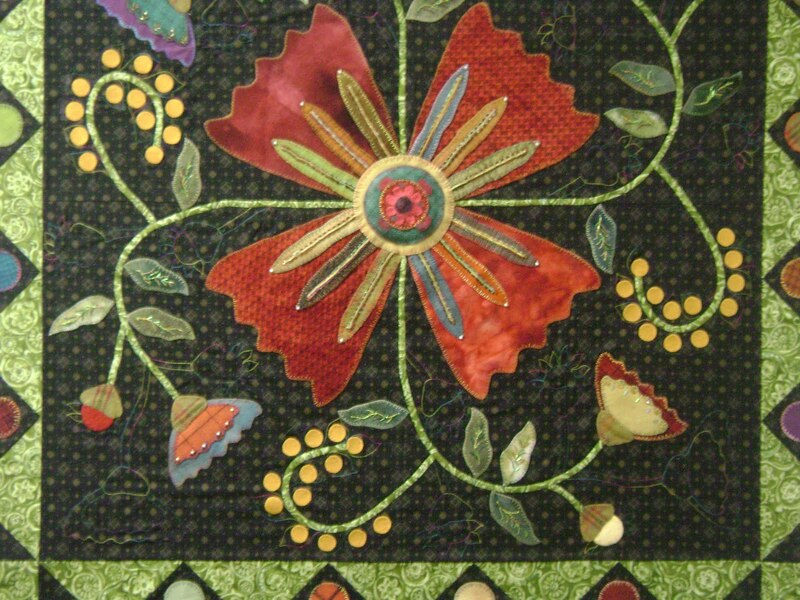 If I pick out the color thread and use a dark one to blend in with the background, it would be just a plain trapunto design around the applique. Ok, this one is being set aside until I figure out what to do. It’s not scheduled to be finished for a couple more weeks so I’ve got some time. Now that I can see it from further back, I like the echo. I think that the trapunto idea with the colored thread will work fine. 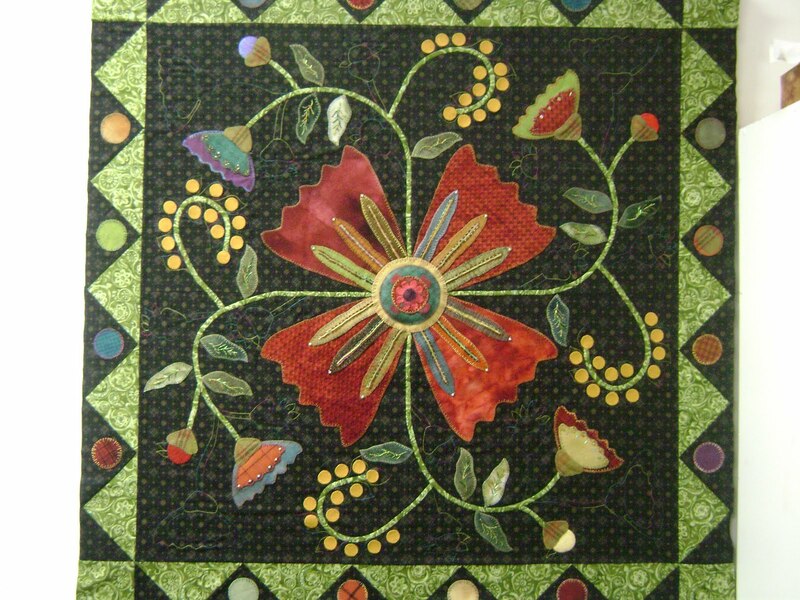 This entry was posted on September 2, 2010 by Anita in Customer quilts 2010, Journey 2010.